A group of private citizens, headed by William Wyman and William Keyser, donated land that became the Homewood Campus in 1902, and the library moved into new quarters upon the completion of Gilman Hall in 1916. The library occupied the inner portion of a hollow square on three levels, placing faculty and graduate student offices near collections in their fields. Each level was a self-contained departmental library, with collections in close proximity to seminar rooms for ease of reference. 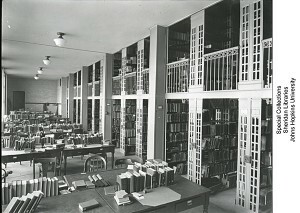 Library Director M. Llewellyn Raney stated that Gilman Hall’s unique interior arrangement made it “the first apartment house among the libraries of the world.” When the library opened in Gilman Hall, it contained nearly two hundred thousand volumes. In March 1931, partly in response to the economic impact of the Depression, a group of private citizens founded the Friends of the Johns Hopkins Library. Members pledged annual contributions to support the acquisition of new materials. 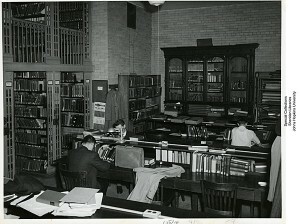 In 1941, just twenty-five years after the library opened in Gilman Hall, Librarian John Calvin French (who succeeded Raney in 1927) noted ominously in his annual report that “nearly every department is troubled by a lack of space.” By this time the collections numbered just over a half million volumes. 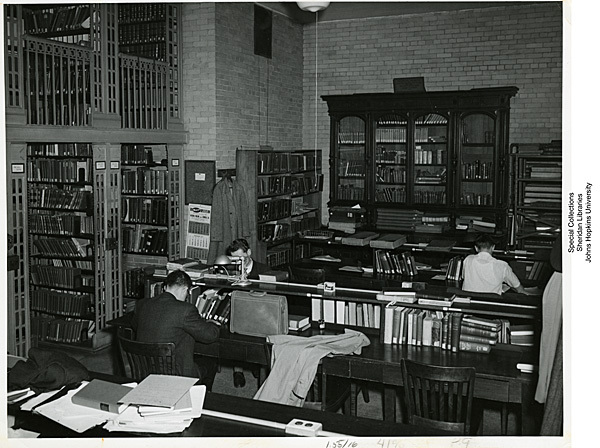 During the Second World War, the library suffered from a problem common to the rest of the University: increased demand for services, prompted by war research, with little increase in space or staff. After the war, several new buildings were constructed while others expanded to meet the demands of returning servicemen. Government-sponsored research continued as the Cold War claimed nearly the same priority as the fighting war. But the library was forced to get by as well as it could, despite a plea from Library Director Homer Halvorson in late 1947 that “the time is fast approaching when we must begin to make definite plans for the provision of new facilities.” Halvorson succeeded French in 1943, who retired to begin writing a history of the University. In 1946, Halvorson suggested constructing an off-campus “repository library” for excess, little-used, and rare books. 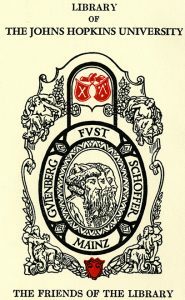 He outlined his idea as a supplement to the Gilman facility, rather than as a replacement for Gilman. Despite Halvorson’s plea, it was another ten years before expansion plans were discussed. In September 1956, Ex Libris [newsletter of the Friends of the Library] reported that Gilman Hall “is seriously overcrowded and outmoded. The building retains much of its original charm but little of its original efficiency as a library structure.” By this time the library had surpassed one million volumes. John Berthel succeeded Homer Halvorson in 1954 and wrote a series of reports emphasizing the library’s crowded conditions and urging new construction. Following up on a consultant’s report, the Trustees commissioned an architectural study in June 1958. In October the University launched a $76 million, ten-year “Decade of Development” fundraising drive. Among the primary needs of the University, President Milton S. Eisenhower included a new library building. Later in 1958, the architects and the Hopkins administration agreed that the east end of the Gilman Quadrangle was the best site for the new structure, and in January 1959 the Trustees concurred. As evidence that the University recognized the importance of a new library, the Trustees resolved in January 1961, “the Library project shall have the highest priority in the University’s current development efforts.” They allocated $1 million from a challenge grant and pledged themselves to raise the remaining $3.5 million of the projected cost. On June 13, 1962, without ceremony, construction began. Part III coming later this month!